Designed to be extremely simple to use, Wormhole is a drag-and-drop file transfer utility that lets you transfer files between any combination of Mac OS X and Windows systems. Just connect, drag your files into the colorful “Wormhole Window,” and they’ll appear on the other side! Even better, no configuration at all is necessary on small networks (such as most home networks): just launch Wormhole on two computers, and they’ll find each other and open a connection with zero clicks! CrystalFire Wormhole allows you to easily copy files between two computers, even if one of them runs Microsoft Windows and one uses Mac OS X. PC-to-PC, PC-to-Mac, Mac-toMac and Mac-to_PC file transfers are all possible with a simple mouse drag. CrystalFire Wormhole does not translate files in any way. It will not either make a Macintosh application run on a Windows computer, or vice versa. Copying a file from Mac to Windows or Windows to Mac is only useful if you have a program on the other operating system that can use it. Luckily, many files these days are cross-platform, including most multimedia and document files. 1 - Launch CrystalFire Wormhole on both computers. 2 - After a few seconds, a colorful "Wormhole" window will appear on both computers. 3 - Drag and drop files or folders onto the window, and they'll automatically be copied to the other computer. That's all you need to do! On Windows, you'll need Windows (98, Millennium Edition, 2000, or XP). On the Macintosh, you'll need Mac OS X, preferably Mac OS X 10.2 or higher. Connecting on Large LANs, or the InternetIf the "automatic connection" above doesn't work, or you want to send files further than your local network, you'll need to follow a few more steps. Let's assume computer "A" wants to talk to computer "B." 1-On computer "A", select "Show IP address" from the File menu. This gives you a number, called your IP address. This number is like a phone number; it lets other computers on the Internet identify your computer. Write it down. 2- On computer "B", select "Create Wormhole To..." from the File menu. Enter the IP address of computer "A" in the "Connect To" box (the periods are important, don't leave them out! ), and press Connect. Connecting may take a few seconds. 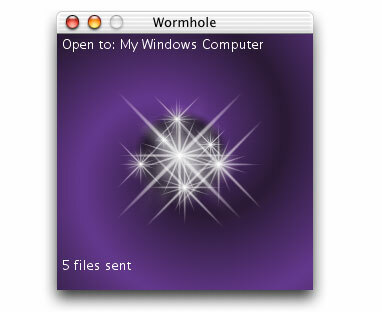 If it works, you'll see the star-filled "Wormhole" window, and you're ready to transfer files. 3- If not, you'll get an error message of some kind. Try the connection in the other direction (that is, reverse "A" and "B" in the above directions). This will often solve connection problems due to NAT and firewall problems. Important Note: CrystalFire Wormhole is intended for home LAN use, and uses no security or encryption of any kind. If you're using it to send files across the Internet, there is the possibility that they may be intercepted. Do not transmit highly secure information across the Internet using Wormhole. You can transfer files either direction along an open wormhole, although they can travel in only one direction at a time. To transmit a file, drag and drop it into the wormhole window. Alternatively you can also select "Transmit File..." from the File menu. You can also drag and drop several files, or a folder full of them and they will all be transmitted one at a time until all the transmissions are complete. While a file transmission is in progress, you'll see the stars "wink", and the total number of files sent and received will appear at the bottom of the window (if the window is big enough). When a file is received, it is placed in a folder called "Received Files", in the same folder as the Wormhole application. In most cases this will be opened for you when files arrive; if not, you can open it by selecting "Open Receive Folder" from the File menu. Important Note: The files transmitted by CrystalFire Wormhole are copies. While the file contents will be the same on both ends, certain details of the file, such as creation and modification dates and permissions will be different. There are certain other situations (described below) when information may be lost in cross-platform file transfers from Mac to Windows. Network problems can result in files being only partially copied. Have you ever been browsing on a computer, when you find a URL or other tidbit of information that would be really useful to have on another computer? If you've got a Wormhole open between two computers, you can transfer the (text) contents of the clipboard to the other machine by selecting its window, then pressing Control-L (Command-L on the Mac). 1 ­ On computer "A" select some interesting text, and copy it to the clipboard ("Cut" or "Copy" from the Edit menu in most applications). 2 ­ Select the Wormhole window on computer "A" that connects to computer "B"
3 ­ Press Command-L (Macintosh) or Ctrl-L (Windows). On Computer "B", you'll see a "clipboard" icon appear in the lower right hand corner of the Wormhole Window. 4 ­ On computer "B", place the cursor in a word processor, browser address bar, or anyplace else that accepts text, and paste from the clipboard ("Paste" from the Edit menu in most applications.). Although it's primarily intended for small-network use, Wormhole will work over the Internet, as long as at least one of the computers can "see" the other. Unfortunately, many situations can cause computers not to be able to see each other, including home and office firewalls, routers, NAT, proxy servers, dynamic addresses, and good old-fashioned network problems. Unfortunately, most of these problems need a fair amount of networking knowledge to solve. If you don't have a network administrator handy, and you just can't find a way to make Wormhole work through your network security, you may need a more industrial strength file transferring solution.If one of the computers is behind a firewall, router, or NAT server, you'll either have to initiate connections from that computer, or have to have your Network Administrator set up the firewall to "forward TCP and UDP on port 14688" to your computer. A full FAQ is accessible here. As a special offer Wormhole costs only USD $ 10 until August 1st 2003.